Update at bottom. 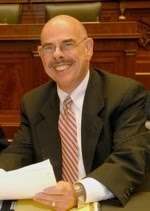 Honorable Henry Waxman is irate that US corporations are obeying the law. So he has called them to Congress to answer for their actions. Boeing Co. expects to take a $150 million charge against first-quarter earnings because of recent government health-care changes. That is going to cost me. AT&T says costs of the new healthcare law for their company is $1 billion, John Deere & Co., $150 million; Caterpillar, $100 million; 3M, $90 million; AK Steel, $21 million; Valero Energy, $30 million; and most recently Prudential Financial Inc. said it will take a $100 million hit in its first quarter. Their accounting also estimated there would be thousands of lay offs, and consumer-cost increases. The disclosures, tied to a 2013 elimination of a tax break on retiree drug benefits, ultimately may shave as much as $14 billion from U.S. corporate profits, according to an estimate by benefits consultant firm Towers Watson. Human Events US corporations are required by law to report anything that impacts their bottom line or value - Securities and Exchange Commission disclosure requirements passed by Congress after the Enron scandal. Malkin So they obeyed it and are in trouble with Honorable Henry Waxman. He says it makes ObamaCare look bad. He is right about that. ObamaCare will impact our entire economy like this. It hurts, Henry. Henry says they announced these impacts now to hit back at ObamaCare. No, Henry. They acted to obey the law - passed by Congress. They are required to report negative impacts right away - can't wait. Where were you? Maybe Honorable Jim McDermott will talk some honesty into Henry. He was there too. Alt source: CNS News Update: WSJ catches distinguished Commerce Secretary Gary Locke getting it exactly backwards. He's just memorized the talking points. Cross posted at Economic Freedom.